I thought this would be a fun easy way to celebrate the 4th of July. 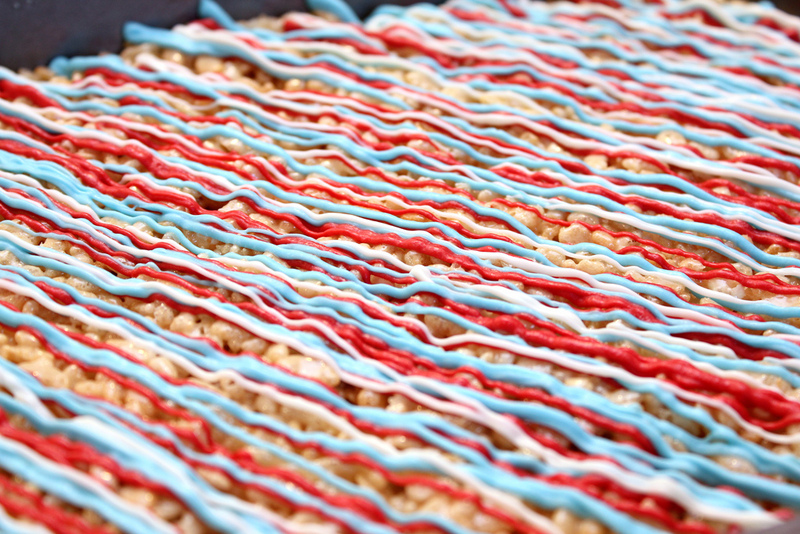 I love rice krispie treats and I feel like they are so easy and perfect for barbecues or large get togethers. I’ve altered the recipe from the normal rice krispie treats because I really don’t feel like it calls for enough marshmallows. Plus I hate when you make rice krispie treats and the next day they are hard as a rock. So in this recipe there is a little extra butter and marshmallows and I add karo syrup to keep the treats from hardening. They still will if you don’t put into an air tight container, but it will take a couple of days for them to harden instead of a couple of hours. Not to mention all the extras make these treats so gooey and yummy!! Then I just piped some white chocolate and chocolate with peanut butter over the top to dress things up. You can also use cookie cutters to cut your treats into shapes. Enjoy! Prepare a 9 x 13 inch pan by coating with cooking spray, set aside. In a large saucepan melt butter over low heat. Add karo syrup and marshmallows and stir until completely melted. Remove from heat. Add Rice Krispies cereal. Stir until well coated. Spread into the 9 x 13 and let cool. Melt red, white, and blue chocolate in glass bowl. The easiest way is to place in the microwave for 1 minute, or you can melt in a double broiler. Or melt semi-sweet chocolate and peanut butter. 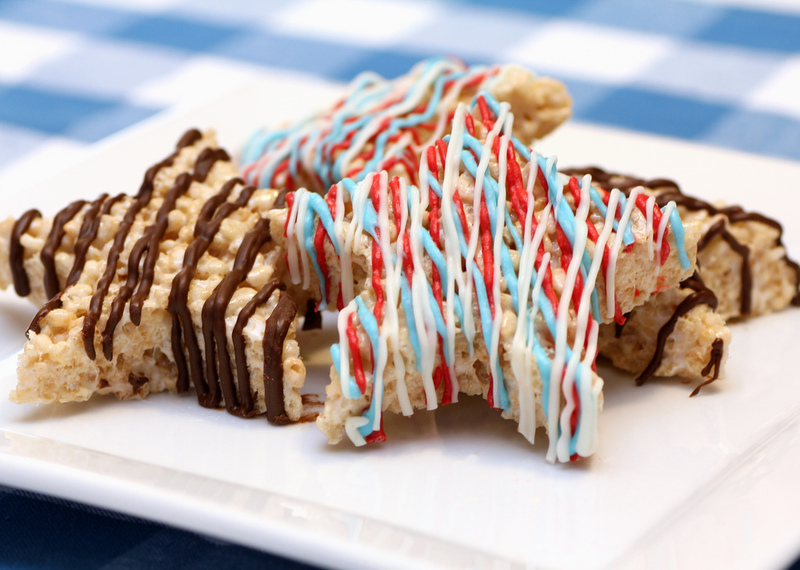 Pipe over cooled rice krispies treats. For instructions on how to pipe chocolate easily click here. I like to cut the sheet of treats before I pipe the chocolate, just to make it easier, but either way works. Store in air tight container. « Patriotic Apple Pie » Over 100 Posts!! !